Big O notation is a convenient way to describe how fast a function is growing. When studying the time complexity T(n) of an algorithm it's rarely meaningful, or even possible, to compute an exact result. Typically we are only interested in how fast T(n) is growing as a function of the input size n.
For example, if an algorithm increments each number in a list of length n, we might say: "This algorithm runs in O(n) time and performs O(1) work for each element". Definition: Let T(n) and f(n) be two positive functions. We write T(n) ∊ O(f(n)), and say that T(n) has order of f(n), if there are positive constants M and n₀ such that T(n) ≤ M·f(n) for all n ≥ n0. 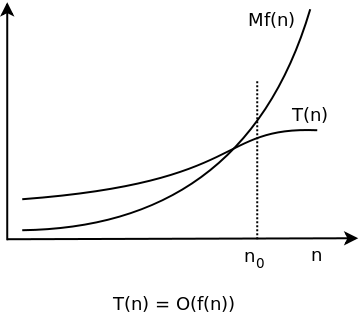 Basically, T(n) ∊ O(f(n)) means that T(n) doesn't grow faster than f(n). Let's start with the simplest possible example: T(n) ∊ O(1). According to the definition this means that there are constants M and n0 such that T(n) ≤ M when n ≥ n0. In other words, T(n) ∊ O(1) means that T(n) is smaller than some fixed constants, whose value isn't stated, for all large enough values of n.
An algorithm with T(n) ∊ O(1) is said to have constant time complexity. An algorithm with T(n) ∊ O(n) is said to have linear time complexity. The algorithm reverse from Time complexity explained had time complexity T(n) = n2/2 - n/2. With Big O notation, this becomes T(n) ∊ O(n2), and we say that the algorithm has quadratic time complexity. The notation T(n) ∊ O(f(n)) can be used even when f(n) grows much faster than T(n). For example, we may write T(n) = n - 1 ∊ O(n2). This is indeed true, but not very useful. Definition: Let T(n) and f(n) be two positive functions We write T(n) ∊ Ω(f(n)), and say that T(n) is big omega of f(n), if there are positive constants m and n₀ such that T(n) ≥ m(f(n)) for all n ≥ n₀. Definition: T(n): ∊ Θ(f(n)) if T(n) is both O(f(n)) and Ω(f(n)). If n ≥ 1, then T(n) = 3n3 + 2n + 7 ≤ 3n3 + 2n3 + 7n3 = 12n3. Hence T(n) ∊ O(n3). On the other hand, T(n) = 3n3 + 2n + 7 > n3 for all positive n. Therefore T(n) ∊ Ω(n3). And consequently T(n) ∊ Θ(n3). In fact, O(n log n) time complexity is close to linear: it takes roughly twice the time to solve a problem twice as big. An algorithm with quadratic time complexity scales poorly: if you increase the input size by a factor 10, the time increases by a factor 100.